Learned something interesting about Phosphorous from an old timer. But is it true? Digger, suffering from writer's block. Bet you didn't know it was possible for a dog to experience this condition. Me either. 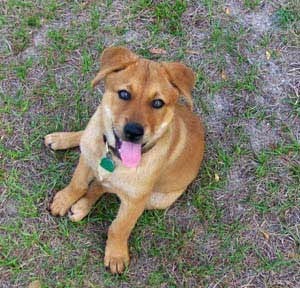 But, then again, who thought it possible a dog could write in the first place? Just proves a point: you're never to old to learn and always be open to news ways of doing things. Well, that's two points, but as I admonished in an earlier post, everyone knows a dog can't count. One of the local old-time farmers and his wife were set up at the market with a very charming booth full of fresh fruit and vegetables. He was obviously a traditional farmer and knew a lot about planting and such. But still, as with most traditional growers, he was set in his ways. After a comment on vegetable taste and, being as how he and his wife were kind and helpful by nature, he began to tell my "persons" why peppers are sometimes not very tasty. "It's the phosphorus," he explained. "that's what gives them the flavor. When growers don't add enough phosphorous, you just don't have any taste." My "persons" took in all he had to say, politely not mentioning the fact that the worm castings we use on our veggies are, as compared to chemical fertilizers, not very high in phosphorous and our veggies are very tasty and sweet. I know this for a fact, because I always nip off those tender young bean pods whenever I pass. Well, at least until that fence went up. Always on the lookout for knowledge on growing better veggies, my folks did some digging (I know, I know, that's my department. But only in dirt. The research - that's the human's job) on the topic of phosphorus in fertilizers. Quite coincidentally, there was a public service ad on TV recently from the state agriculture extension cautioning against using fertilizers with phosphors on lawns in order to prevent runoff of excess fertilizer into nearby waterways and streams. More info was needed. One online article on phosphate fertilizers we found gives a pretty good expose' on phosphorous. It relates more to landscaping and lawns, but I think you can infer something here to fertilizing vegetables as well. In a nutshell, the myth that phosphate fertilizer will stimulate root growth is just that - a myth. As it turns out, phosphorous deficiency rarely occurs in urban soils. Only soils heavily used in agriculture become depleted of their phosphate. Whenever any plant nutrient is lacking, plant growth slows. Once that nutrient is added back, plant growth resumes. This growth restoration is then interpreted as growth stimulation and then miraculous qualities are attributed to the fertilizers used. The tendency is to add excess phosphorous, in our farmer's example, in the effort to achieve even better results and, in some minds, better taste. 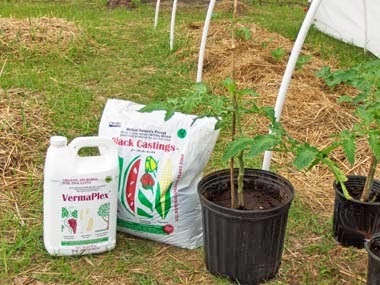 According to research, over application of fertilizer in general and phosphorus in particular, are potentially very harmful to beneficial soil organisms and surrounding waterways. Excess amounts are simply leached away in irrigation and rain. Resulting algae blooms in nearby lakes and streams lowers oxygen levels which will kill fish and other animals. Not to mention the harm it does to one's pocketbook. Maintain mulch to facilitate slow release of phosphorous and other nutrients. 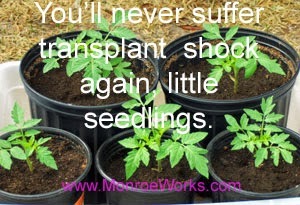 Don't use phosphate fertilizer when transplanting. 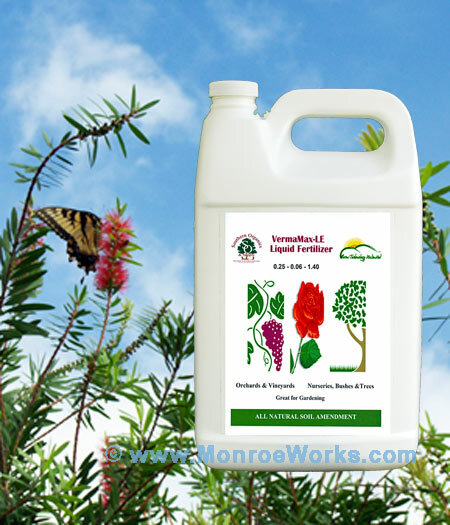 Incorporate foliar applications to prevent excess nutrients being added to soils. They are naturally slow release and add beneficial microorganisms to the soil. 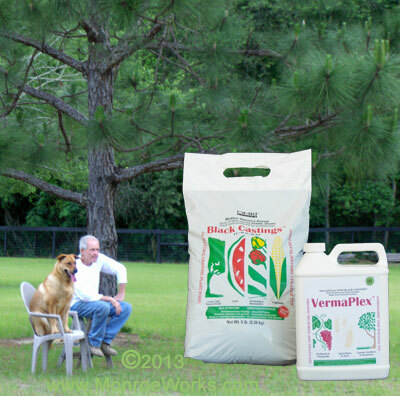 VermaPlex is excellent as a foliar feed for extra applications if plant requires it. NPK levels appear at first glance to be low, but only because of the slow release quality of the castings. 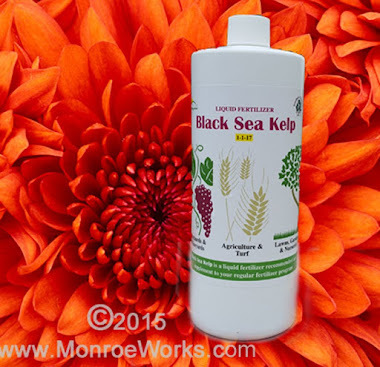 Microorganism, consuming the organic content, provide a steady stream of NPK, so that, rather than one large dose of which the plant only utilizes a small portion and the rest is simply washed away, nutrients are available continuously in the amounts the plants needs. And the taste is the finally test. From out experience, you just can't get any better (other than fresh bunny rabbit, that is. Heck, I even prefer road-kill, but that's just me).